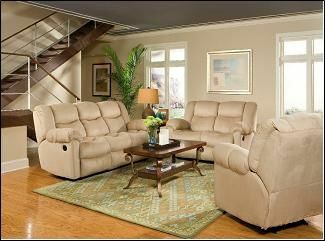 3 piece suede reclining set. Padded suede. 31800R Sofa Reclining 83Lx41Wx39H 243 lbs. 31801R Love Reclining 61Lx41Wx39H 217 lbs. 31802R Rocker Reclining 38Lx41Wx39H 124 lbs.